Excellent 'pick me up' for tortoise if a bit too slow after hibernation. Just follow the instructions on the pack. My vet advised me to use this product while bathing them in shallow warm'ish water 3 times a week, then twice a week until they were back to normal. Great and what a relief. Was advised by a reptile vet. 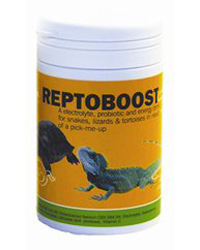 Highly recommended by some more experienced bearded dragon owner friends and has massively helped a dehydration issue in one of my rescue dragons. Worth the money!